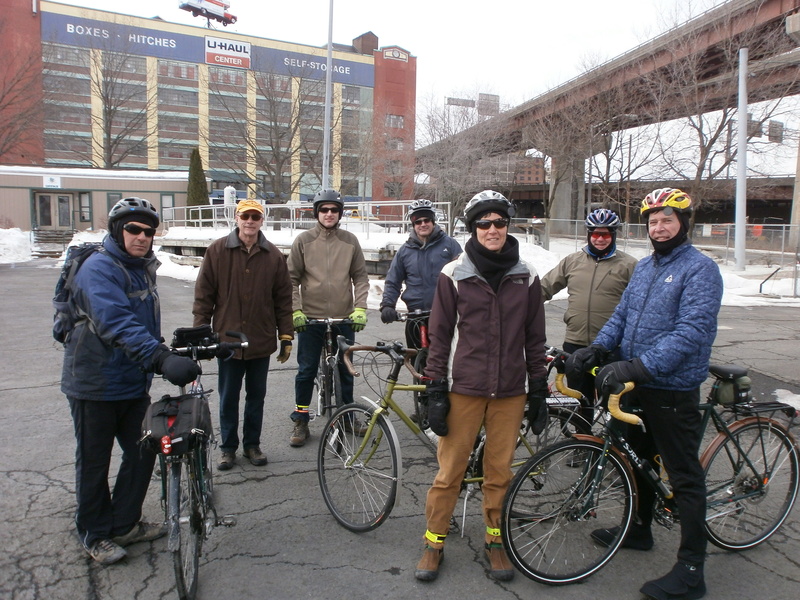 PRE-RIDE – We kicked off the monthly series of planned orientation rides on the proposed South End Bikeway on Saturday, March 7, 2015. Nine intrepid riders – with the youngest being 18 months old – met under the (pounding) I-787 at the Boat Launch/Row Center in the Albany Corning Preserve. We started with a League of American Bicyclists mini “Safe Cycling” course sponsored by the Albany Bicycle Coalition. We had several adults and one youth for the class which featured a description of the full course, helmet selection and fit, pre-ride “ABC Quick check of our bicycles,” signaling, “rock dodge,” and scanning (to the rear). HEADING OUT – Leaving from the start of the Erie Canalway Trail and the Mohawk-Hudson Bike-Hike Trail, we headed along the current multi-use pathway to the central parking area where we learned about the $8-million Albany Corning Preserve project and the proposed South End Bikeway Link. He pointed out the “flyover” – an adaptive re-use of an unneeded I-787 ramp into a multi-use “high line-like” parkway for people on bicycles and on foot. 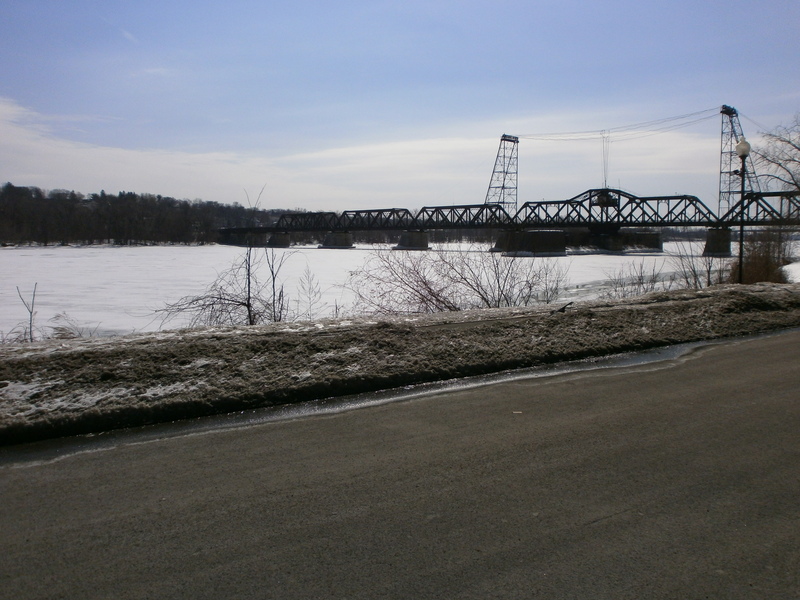 This would connect the waterfront to Clinton Ave. as well as to the bike-hike path over the new Livingston Avenue Bridge that, in turn, would open a water-level route to Rensselaer and to S. Troy. A LITTLE ICE – With temps in the high teens, we were bound to, and did, encounter a few icy spots but a little walking or a steady had on the bars got us through that so when we arrived at our next orientation spot at the Slater we were all nicely warmed up. At the Slater, we looked at the terminus of the Albany County path and then to the 1.8-mile on-street gap separating us from the Albany County Helderberg-Hudson Rail Trail head on S. Pearl. TERMINUS – With the sun getting warmer and warmer, we headed south past the choke point at the U-Haul on Broadway toward Island Creek Waterfront Park (with its potential as a spot where people can begin their rides or walks) where we again paused to look at the planned off-street crossing, the Island Creek Waterfront Park, the UA Alumni Row Center, and the proposed full-service marina on Broadway. A LITTLE HISTORY – Just before the rough-and-tumble railroad crossing, we looked at the reported site of Fort Nassau, the tank bombs, and the off/on ramps for I-787, one of which will be the protected bicycle lanes for the South End Bikeway Link. We swung around to western ramp, noted the super wide shoulder, and went on to S. Pearl. We stopped at Mt. Hope Drive to hear about Ezra Prentiss, Joel Rathbone, and other historical notables who lived in or settled the area. We learned about the now-vanished Kenwood village and gained an appreciation for the powerful history of the immediate area and how it will enrich the SEBL’s value for all. We observed how critical would be enhanced signalization at Mt. Hope and Pearl to facilitate people crossing form the west side of S. Pearl (from the 2-way cycle track) to the I-787 ramp, one lane of which will become the protected bicycle lanes. CRAZY STREET – While heading toward the end of our tour, even the experienced road riders noted the aggressive, on-your-tail, outta-my-way behavior of the people in cars and trucks and how meaningless the shared lane markings and “share the road” signs were in helping us along. In covering the route, we noted with sadness the loss of life – Jose Perez (2006) and Qazir Sutherland (2013) in the very streets we are trying to bypass on our preferred route. This enhances the urgency for protected bicycle lanes by this fall in time for the Albany County Helderberg-Hudson Rail Trail opening. START HERE – At the intersection of South and Old South Pearl, we looked at the railroad overpass, the area of the planned 12-car parking lot, and the to-be-closed pedestrian tunnel under the roadbed. Crossing under the railroad overpass, we swung onto Binghamton St., went to the end, and learned about the Mohawk and the Mohicans. While we did not spot the promised bald eagle, we did see a red-tailed hawk. TANK BOMBS – At this point, we made our way speedily back on our route, using the eastern I-787 ramp. Our plans to return via Broadway were dashed by the stopped fleet of DOT 111s on the crossing. We noted sadly that yet another 103-tanker train had yet another derailment in Illinois. With 34,500 gallons in each car, the explosion/conflagration caused evacuations in a one-mile radius where the Galena River joins the Mississippi. (By the way, if about half of those gallons was converted to gasoline [the rest being waste, heating oil, spillage, plastic bottles, etc.] an Escalade could go 1,326 miles – well worth it Commissioner Martens!) In any case, we returned to our starting point via Quay St.